The completion of the Transcontinental Railroad was one of those rare historical events when the people participating were fully aware of how wide-reaching its impact would become. Though the tracks build by the Union and Central Pacific railroads was shoddy, and other transcontinental routes were in the works as they finished construction in May 1869, the importance of their achievement could not be understated. For the first time, the continent was spanned, and one of mankind’s oldest and most stubborn natural enemies--distance--was conquered. 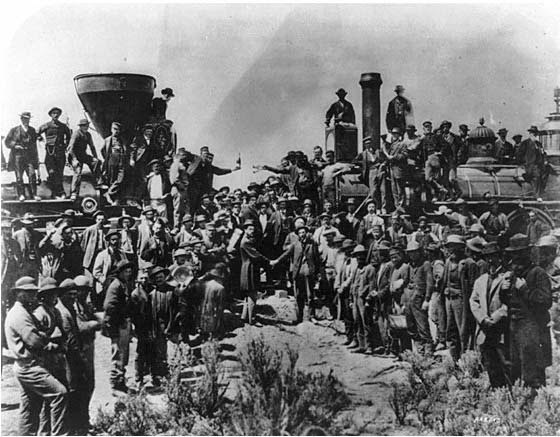 The completion of a transcontinental railroad had been in the works for almost ten years, and its completion was well played in contemporary news outlets. The photograph of the first two locomotives to meet point to point on the new tracks, the Jupiter and the 119, has become one of the most enduring photographs ever developed. After this event, both the Jupiter and 119 were returned to general service. The Jupiter was renumbered as CP # 60 after a few decades, and the 119 as the 343. Both received numerous cosmetic and technological refurbishments over the years. They ran until the early 1900s--a decent working lifespan for a machine--and then broken down into scrap. 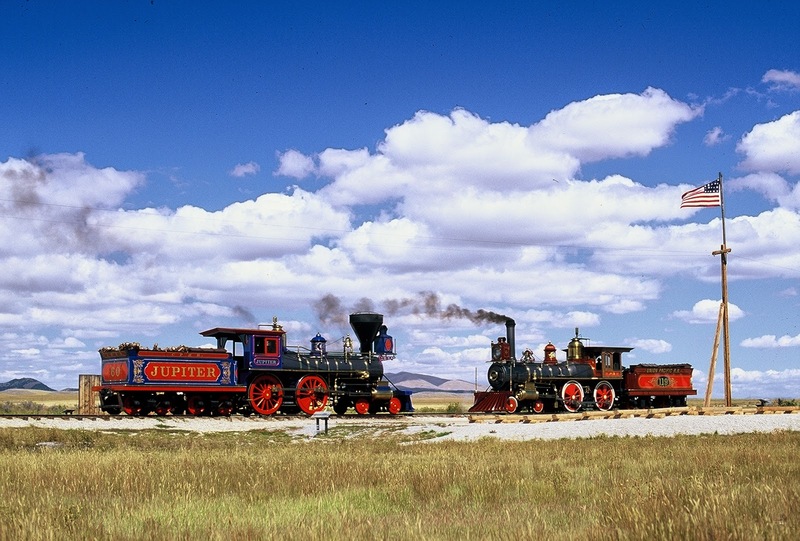 The historical value of these two locomotives was only fully appreciated after they were gone, around the time that the centennial of the Transcontinental Railroad rolled around. 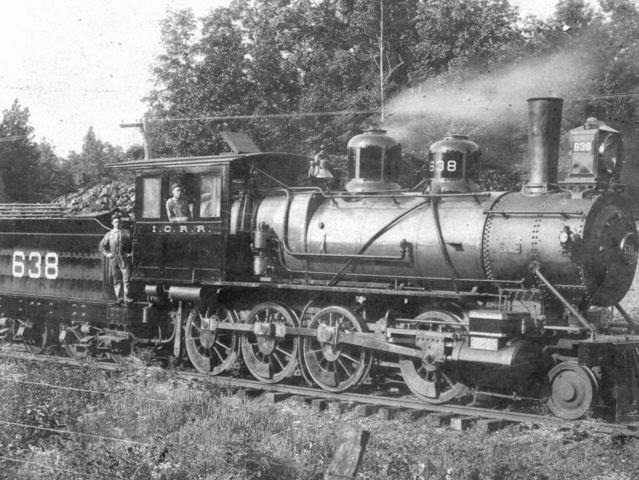 After several years of staging reenactments with borrowed locomotives, the National Park Service commissioned exact replicas of the Jupiter and the 119. As of this writing, both locomotives are undergoing a boiler renovation and are due to return to service May of 2015. John Luther Jones, better known as Casey Jones, is a minority among American folk heroes: He was based on a real person, and the story of his life did not need to be exaggerated. He was born in 1863, adopted his nickname from his hometown of Cayce, Kentucky, and quickly rose through the railroad hierarchy after signing on with the Mobile and Ohio Railroad. He became well known for his skill as an engineer and his unique whistle calls, and was typically assigned to run the most technologically advanced locomotives of the time. For the great majority of his time as an engineer, he drove and favored the Illinois Central no. 638. Unfortunately, the most storied event of Casey Jones’s lifetime was his death. After a botched switching maneuver on April 28, 1900, Jones ran the passenger train that he was operating into the back of a parked freight train. He prevented any passenger fatalities by remaining on the engine, but at the cost of his own life. An African-American engine wiper named Wallace Saunders, who worked out of Jones’ home terminal, penned the lyrics to the still-popular folk song. In April of 1862, nineteen Union soldiers men lead by James Andrews captured a sidelined Confederate locomotive, the General,while its crew breakfasted in a nearby restaurant. They proceeded into northern Georgia with the intent to leave as many cut telegraph lines and destroyed track infrastructure as possible. 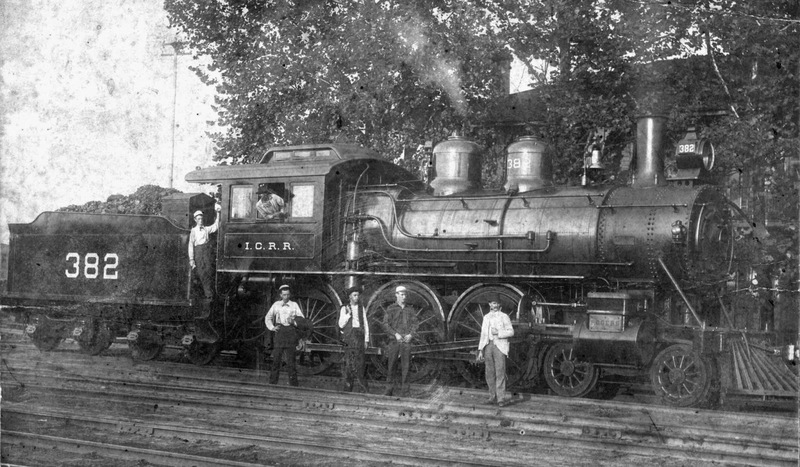 The General’s crew and Confederate soldiers pursued the raiders, first on foot and then with a series of different locomotives: the Yonah, the William R. Smith, and finally the Texas. The Andrews raid, as it came to be known, is notable as much for the drama of the story as for being one of the first instances in American history in which mechanized transportation played a strategic part in warfare. Recognizing this, the General and the Texas are both preserved in non-functioning condition to the present day, and several locations where the raid took place have been declared historical markers. The Yonah and the William R. Smith, unfortunately, have both been lost to history. The Yonah was already 20 years old and outdated at the time of the Andrews Raid and was taken out of service about fifteen years later. The exact fate of the William R. Smith is unknown, but it likely would have been scrapped sometime around the beginning of the 20th century. In the end, the Andrews raid failed to make any lasting difference in the course of the war, and most of the Union soldiers involved were captured and executed or held prisoner. The entire story was adapted for the big screen in Buster Keaton’s 1926 silent film The General. Not only has this movie has stood the test of time and is still regularly included on many best-of-film lists, it was quite a technological feat for the time. The most intricate scene involved a locomotive plunging into a river after a burning bridge gives way from underneath it. The film makers deemed that models would not be sufficient for this scene and plunged a real locomotive, the Oregon, Pacific and Easter number 5, into the water. Its skeleton remained there until it was dredged up for scrap during World War II. Come to think of it, it would be nice to have that one around too. In the 1930s, the end of passenger rail was easy to see on the horizon. Railroad companies reinvented their advertising campaigns and equipment during this period, hoping to retain as much of their ridership as possible. In order for the public to believe that the railroads has a place in the future, they had to look the part. In February of 1934, the Union pacific received a brand new locomotive, the M-10,000, and three articulated passenger cars designed to match. It was notable both as the first internal combustion engine used in a passenger route, and the first streamlined engine. The train was smooth in its profile, quite different from any equipment running at the time, and had a slightly biological look that earned it another nickname, “The Tin Worm.” Streamlined engines were intended both to cut down on air resistance and thus fuel use, and to convey that the railroads were on the cutting edge of technology even if their role in daily life was receding. Initially, the M-10000‘s role was much more s an ambassador than as a working engine. In 1934, the Union Pacific took it on a 13,000 mile tour around the continental United States, and allowed President Roosevelt a personal inspection of the locomotive and other equipment. In all, around a million people turned out to get a look at the M-10000. Eventually, the train was put into service between Kansas City and Salinas and officially named the City of Salinas. A number of other railroads rushed to produce designs inspired by the M-10000. The first to follow, the Pioneer Zephyr, had actually been developed concurrently and arrived on the Chicago, Burlington and Quincy Railroad routes only two months later. 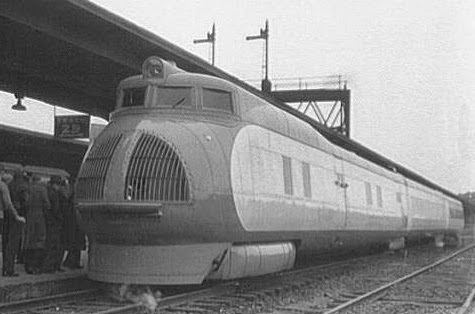 It was more technologically successful and in some sources is referred to as the first streamlined train. Despite being revolutionary, the M-10000 served barely a decade before being replaced by locomotives with a higher power-to-weight ration. The M-I was dismantled and scrapped during the WWII metal drives. * The engine numbered 382 at the Casey Jones Museum is actually Clinchfield Railroad # 99.